The rickshaw is long out of date, but in days past it was a widely used form of urban transport. For public hire and for private use, it also created new employment. The first rickshaw in Hong Kong was of Japanese construction. But, as time went by, the rickshaws that came into use were locally made. There were many stores involved in the manufacture and maintenance of rickshaws. Repairs were always needed, especially during the periods when rickshaws had to be presented to the Government for inspection and re-registration. The rickshaw has its origin in Japan. It was reportedly the brainchild of Rev. J. Goble of American Baptist Free Mission who built one in 1869 to carry his invalid wife Mrs. E. W. Goble to take the air in the streets of Yokohama. Rickshaws soon became popular and spread throughout Asia. It made its way to Hong Kong in January 1874, when one was imported from Japan for a shipbroker named Mr. S. L. Heinemann who wanted his own form of transport (The Hong Kong Times, 23 January 1874; The Chronicle & Directory for China, Japan, & The Philippines, 1874). 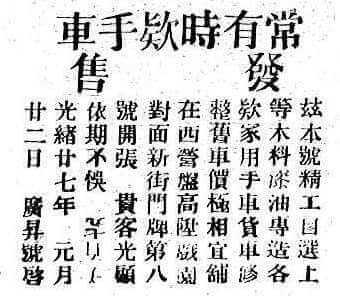 The rickshaw was tried out for public transport in Hong Kong in April 1880 when a total of 30 were plying for hire (The Hongkong Daily Press, 1 May 1880). Afterwards, the number in service rose, growing from “500” in 1882 to “585” in 1896, and then “700” in 1900. In 1901 the Government issued hundreds of additional licences, in response to the city residents’ complaints that their private rickshaws were lying idle for want of coolies. As a result, new rickshaws were made to add to the fleet, making a total of “1,340” public rickshaws by the end of 1901 (Hongkong Legislative Council Sessional Papers, No. 10/1902). Most of the coolies did not have rickshaws of their own but hired them from “bosses”. In the census of the population of the city of Victoria in 1881, a total of 15 persons were counted as “Jinricksha Letters” – rent capitalists who let out rickshaws for hire. Rickshaws were often let twice in the course of 24 hours, both day and night, in the same way that taxis are handled at present. By the end of 1891, seven “Jinricksha Makers” came into existence within the city limits (Census reports for 1881 and 1891). Newspaper advertisements provide evidence that rickshaws were in considerable demand from wealthy families and businesses that needed or wanted their own form of private transport. The undersigned of the above advertisement—a rickshaw maker—welcomes orders from local people. He begs to inform the public that his products are skillfully made, fitted with high-quality lacquer and woodwork, and very reasonably priced. In that year (1901) there were 23 rickshaw makers with a production capacity of 500 rickshaws a year (Hongkong Legislative Council Sessional Papers, No. 47/1901). 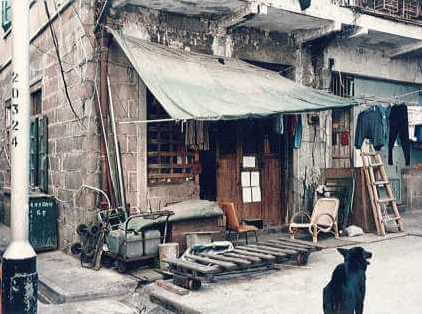 By the twentieth century, Hong Kong had built up a reputation as a reliable provider of rickshaws. In 1906, Mr. C. Partridge, District Commissioner in Ikot Ekpene, Southern Nigeria, asked for tenders from Hong Kong producers for large numbers of rickshaw wheels and axles (The Hongkong Government Gazette, 15 June 1906). In March 1914, a firm of rickshaw makers in Hong Kong recruited a batch of 101 coolies to proceed to France to pull rickshaws at the Lyons International Exhibition (Report of the Secretary for Chinese Affairs, 1914). 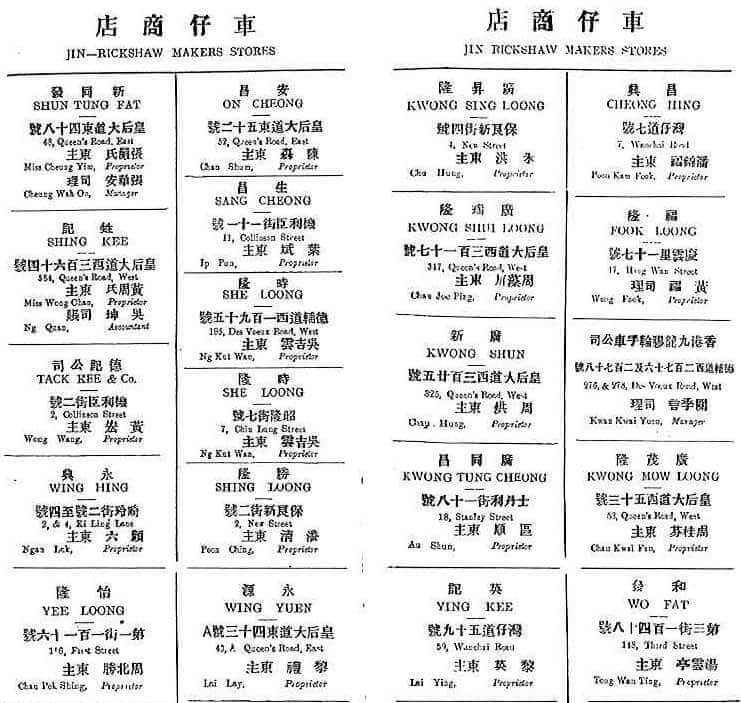 The 1915 edition of The Anglo Chinese Commercial Directory (original Chinese title: 香港商務交通錄) recorded the addresses and names of 21 rickshaw makers’ stores which were located in many different parts of Hong Kong Island and the Kowloon Peninsula. Although the proprietors and/or managers of the stores were mostly men, there were female proprietors such as Miss Cheung Yim (???) who was apparently a widow. 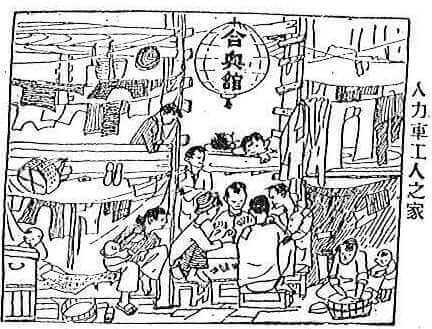 In 1920, a number of proprietors of rickshaw makers’ stores joined together to establish the Hong Kong Ricksha Trade Employers (On-Hang) Association (香港人力車安行商會) to promote the benefits of member stores. The function of a rickshaw makers’ store was something more than the manufacture of rickshaws and repairs. Many of the store keepers were not just “bosses” letting out rickshaws, but also providers of dormitory accommodation. There were many cases where on the ground floor there was a hall consisting of a rickshaw workshop and office, whilst on the upper floors cubicles were built for those who plied their trade at pulling rickshaws. Up to the early twentieth century, rickshaws were in abundance. By 1923, 1,982 rickshaws were plying their trade – 1,250 on Hong Kong Island and 732 in Kowloon; in addition, there were 1,441 private rickshaws. The number of rickshaws in the city reached an all-time record of 3,411 in 1924. This was followed with a downward trend of the trade so that by 1939, only 900 public rickshaws were in use, while the number of private rickshaws had dropped to 268 (Annual Reports of the Police Force, various years). During the war from Christmas Day 1941 to August 1945, the lack of motor vehicles enabled the rickshaw trade to make a comeback. Since raw materials were in short supply, the makers assembled new rickshaws by reusing old accessory parts. According to the figures given in wartime newspapers, the fleet of rickshaws in service rose from 858 to 1,029 during the period June 1942 to January 1944. There were still plenty of rickshaws during the immediate post-1945 period, but as soon as Hong Kong’s economy recovered, the final decline of the rickshaw trade started. As the ownership of rickshaws became less profitable, proprietors started to abandon the business. In 1960, the Hong Kong Ricksha Trade Employers (On-Hang) Association ceased registration at its own request. The following years saw a rapid closure of rickshaw stores. In 1976, a little more than 100 years since the first rickshaw rolled down the city streets, a rickshaw making shop in Western District – the last remaining of its kind – was found to be “littered with old spare parts and an assortment of rusting tools” (Hong Kong Standard, 11 April 1976). Let us momentarily take a journey to the western end of Hong Kong Island, where there is an alleyway called Ki Ling Lane (奇靈里, originally called 畸玲里). 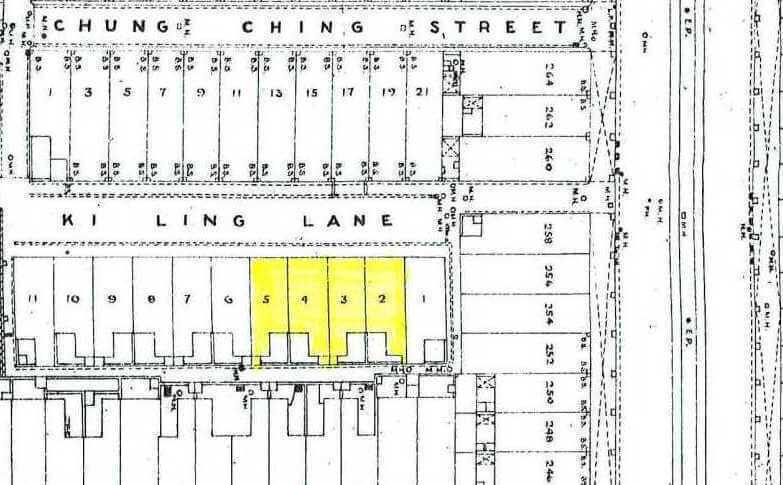 Based on the evidence available so far, Ki Ling Lane was the site of several rickshaw makers’ stores. Out of a row of 11 houses in the Lane, at least four of the numbers (that is, nos. 2, 3, 4 and 5) had been used to accommodate rickshaw makers’ stores. 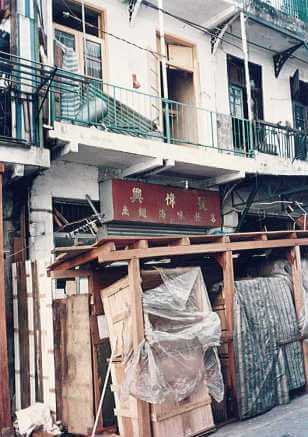 When I made a site visit to Ki Ling Lane just a little more than 20 years ago, I found that nos. 2, 3, 4, and 5 were either vacant or had changed business. At that time, the old house at no. 2 was blocked up, whilst nos. 3, 4 and 5 were boarded up awaiting their date with the bulldozers. In the following year (1993), the old houses were knocked down and the building sites for houses were converted into a public open space known as Ki Ling Lane Children’s Playground. Nowadays, the children’s playground has become a thing of the past, as the site is being converted into a station of the new West Island Line of Mass Transit Railway. I sincerely hope readers enjoy the contents of this article and that it helps them share in a subject that provides a glimpse of the larger history of Hong Kong. This article was first published in the Indhhk email Newsletter 7 sent out on 25th June 2013.
for your wonderful articles about the Hongkong Rickshaws. one wheel is planked wit rubber peaces and the otherside with ochs skin peaces. The hood however seems to be canvased by using army- tent materials. Can you estimate how much this vehicle could be worth ? Or: have you a price for a copy buildt new rickshaw ? Thank you for the article. I recall around Donny and Marie Osmond were on tour in Hong Kong, I had just read in the SCMP that rickshaw license were no longer going to be issued. The first thing that Donny and Marie did was get a photo op riding a rickshaw. Today in San Francisco Ca, USA one can ride in a rickshaw that is attached to a bicycle. The drivers wait in a queue along Embarcadero. The service is designed for tourists.